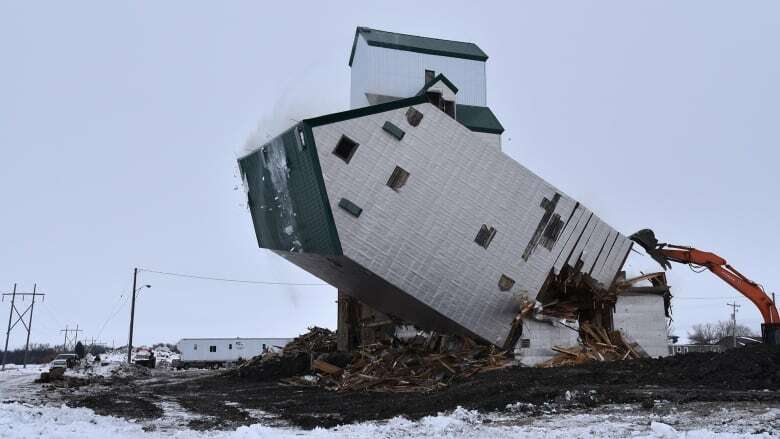 The towering sentinel that has stood over Sanford, Man., for 70 years is on its way out, after demolition on a grain elevator in the community began this weekend. 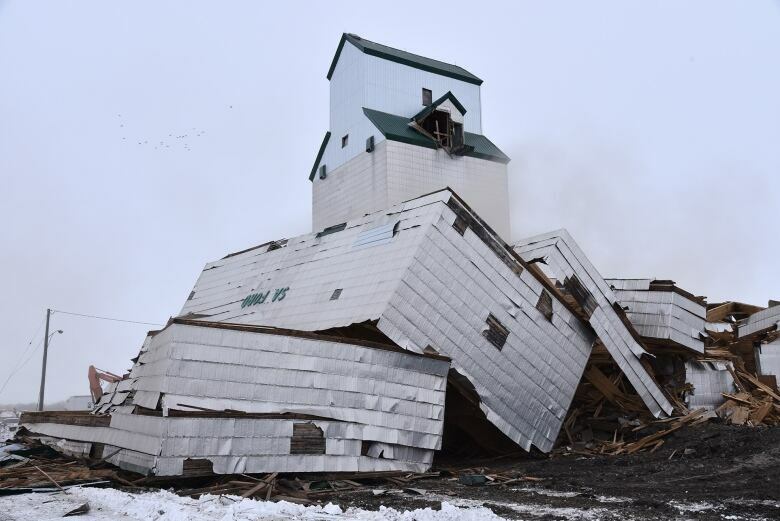 The Prairie sentinel that has stood over Sanford, Man., for 70 years is on its way out, after demolition on a grain elevator in the community began this weekend. 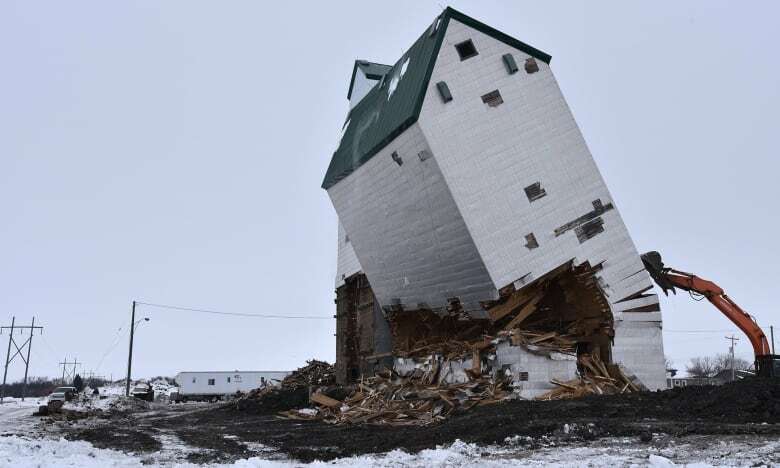 Demolition started Saturday on the wooden elevator and annex, which have stood in the CNR Carman Subdivision in the Rural Municipality of Macdonald since 1949, according to the Manitoba Historical Society. "It was really a quintessentially Canadian moment," said Gordon Goldsborough, head historian for the society. 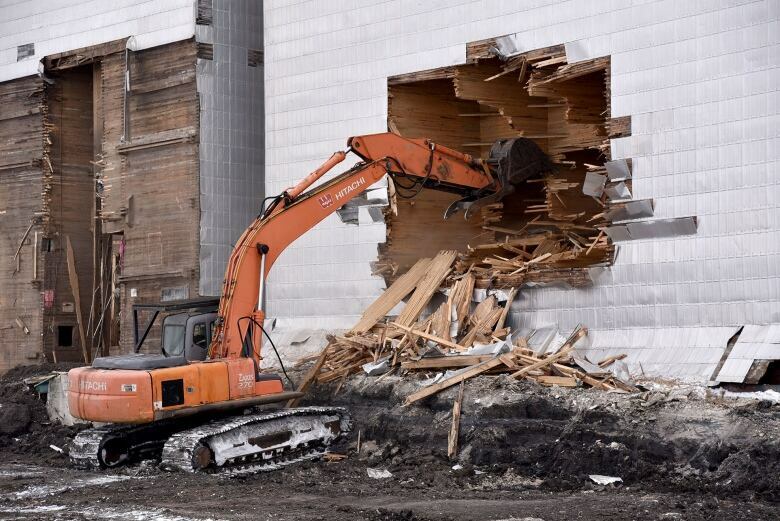 He drove to Sanford, about 30 kilometres southwest of Winnipeg, to watch the demolition of the elevator's annex on Saturday. "There were people out there that had snowmobile trailers and on the trailers they had sofas, and people were reclining on the sofas, having a good time, chatting and watching and drinking and eating. "It was a real party atmosphere, almost." As he watched the demolition, Goldsborough said he thought of the phrase "Another one bites the dust." The elevator, which had been used for private grain storage, is the latest of its kind to go down. Goldsborough said it's a reflection of the shift in agriculture practices to using larger steel structures to hold grain instead of wooden elevators. The remaining wooden elevators are expensive to maintain, he said. This one, which was formerly operated by Manitoba Pool Elevators, got new metal cladding applied in late 2014 to conceal deterioration to the annex portion, he said. "These elevators are sort of a sign of the way that it used to be done, and so it's sort of a sign of that transition from the past to the future," he said. In some cases, the land where demolished elevators once stood has been repurposed for housing, Goldsborough said. He doesn't expect that to happen in this case because the land is so close to train tracks. "This symbol that has stood over Sanford for so many decades is just gone." Only the annex was demolished Saturday, Goldsborough said. The elevator portion will be demolished after that's cleaned up in about a week, the history society wrote on Facebook. 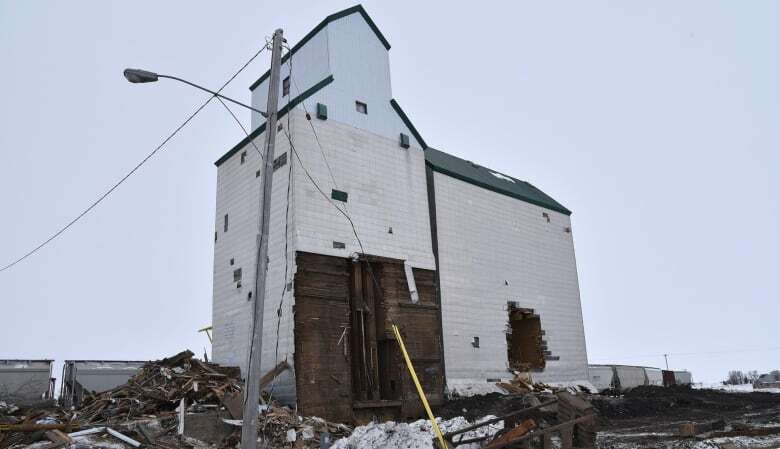 It doesn't make sense to try to save all the grain elevators, he added. But he'd like to see a few special ones protected, such as the set of five in Inglis, Man., or one of the last eastern Manitoba examples in Tyndall. "Pick your battles where you can," Goldsborough said. "No, I don't think we should necessarily plan to save all of them. Just a few so that we won't forget what used to happen when grain was delivered to market by farmers."